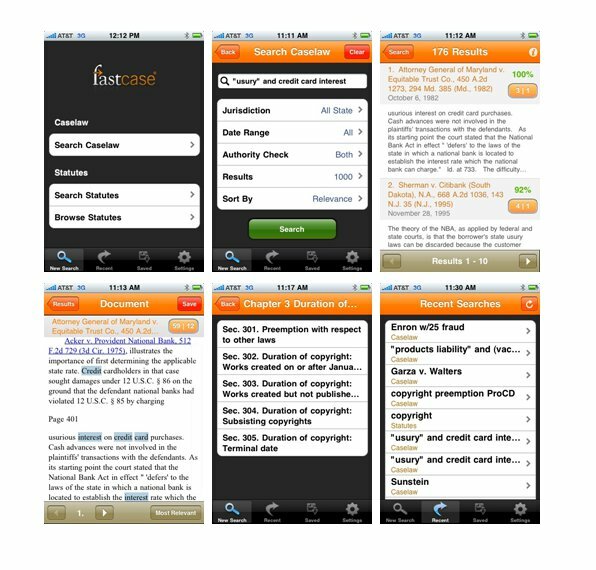 Washington, DC — (January 29, 2010) – Legal publisher Fastcase announced today the release of the world’s first mobile legal research app, now available for the iPhone, iPad, and iPod touch from Apple’s App Store. Fastcase is the largest law library on the iPhone, with free download of the app, and free searching of Fastcase’s comprehensive national law library of cases and statutes. The app uses the same next-generation legal research engine as Fastcase’s acclaimed Web-based platform. Fastcase for the iPhone users can search the comprehensive Fastcase legal research database with keyword (or “Boolean”) search in addition to citation lookup for cases and statutes. The app also supports “browsing” statutes in outline view. Fastcase for the iPhone is available starting today in the iTunes store (search for Fastcase), or you can find more information at www.fastcase.com/iPhone.